Welcome to the cosmetic surgery practice of Dr. Hoang Bui, a premier plastic surgeon in the Orange County area. Our goal is to help you obtain the most beautiful cosmetic enhancement results and an excellent overall experience. Our unique approach is to first provide you with the knowledge to make the right choice for yourself and then artistically enhance your natural beauty utilizing the latest advances in cosmetic surgery. Our number one priority is You. From the moment you first walk through the doors of our office to your final visit, we will do everything possible to make you feel comfortable, cared for, and completely satisfied. 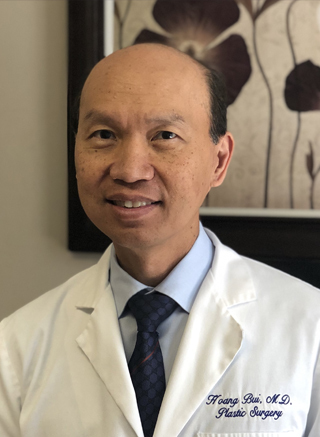 Dr. Bui, a Board-Certified Plastic Surgeon, will listen attentively to your concerns, answer all your questions, provide you with relevant information, and together, he will formulate a treatment plan that is best for you. Dr. Bui and staff welcome your exploration of our plastic / cosmetic surgery, and non-surgical services. Visit our plastic / cosmetic surgery office located in Anaheim, California (CA). Anaheim is in Orange County and is easily accessible from the Los Angeles area. Words can’t express the way I feel. I’m so glad we were blessed with a man who puts hope into one’s heart. I will always be grateful to you. Thank you for answering all of my questions and concerns, caring, being honest, and taking good care of me. I am very happy with my results and overall experience. My surgery and recovery was such a breeze. I feel great and look good, thanks to you, Dr. Bui! Thank you so much. I will continue to send as many patients as I can because you are the best surgeon I know and the best work I’ve ever seen. Words cannot fully express how grateful I am to you and your talented hands and skill as a physician and surgeon. I never thought I could have the beautiful bustline that other women were blessed with. Meeting you and your wonderful staff changed everything. Thank you for your patience with me as I asked so many questions. Thank you for treating me with respect and dignity. Thank you for being honest with me. Thank you for giving me the beautiful breasts I always wanted. I wanted to let you know how grateful I am for everything you have done. I’m so very pleased with my new Body! Dr. Bui I don’t just see you as a Doctor I see you as my friend. Super fantastic customer service – not easily found in this day and age. I commend you all for doing such a great job and your names are “out there”! Thank you again. I feel like a new woman and you all made it comfortable! I just wanted to say thank you for doing such a wonderful job with my surgery. You all have been so friendly and helpful to me! Thank you for making my surgery such a positive experience. I was a bit anxious due to my previous experience with this surgery from a different doctor. You made me feel very comfortable about my decisions and I was very comfortable with you. some of Dr. Bui's patients.